The historical roots of the season we're about to enter in, starting at midnight tonight, can't be overlooked. There is a logical calendar accompanying the time honored traditions of faith. The Advent/Christmas season starts in the late fall and goes on into December 25th. The Lent/Easter season goes from tonight until Easter, April 6th this year. And each season holds an unbelievable time for those of faith to reflect and worship God's natural calendar through the year. It's an interesting look at the reason why we celebrate these festivals. You can find several reasons throughout the past we celebrate such events, but the bottom line seems to be more and more of our most time honored traditions have been laced with pagan celebrations of winter, spring, and other naturalistic traditions, and they've been turned into these pseudo pagan reasons to party laced with faith. I don't mind a good party. But as I watch what Mardis Gras has turned into, I'm disturbed by its religious overtones. It certainly seems like God would probably not be so excited about a time where every debaucherous act was put on display and accepted, so the next day we could all be holy. You know? Again, don't get me wrong. I like to have a good time. But if it's just a good time we're after, then let's drop all the ties to faith. 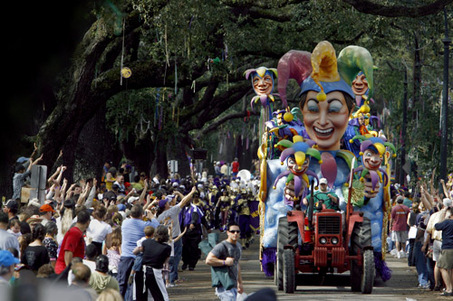 Some might say, "Well, if you were at Mardis Gras, you wouldn't find anything about faith." But we can't deny lent begins tomorrow, and there are several people who are going to willingly or by pressure from peers try to marry this very sacred time leading up to Easter with nakedness, drunkenness, and pretty much the most filthy acts of humanity. If it's a party we're after, let's just call it that. It's a party. But if we're going to follow the time honored calendar of the church, maybe we need to look a little harder into the core message of it's figure heads. I guess, I'm just saying…let's be honest. Nice blog.Now,from your blog,I know something others. thanks.